As shown in Diagram 1*, in a close environment, the contribution of Radiation is the highest among all sources of heat. The roof is the surface of a building that is most exposed to solar radiation and the solar gain absorbed by the roof is directly transmitted down to the attic space. When a radiant barrier is placed underneath the roof covering, leaving an air space, almost all radiant heat will be eliminated. In cold climate regions, the radiant barrier holds the heat inside the building closed environment. Installing a Radiant Barrier is the best solution to save energy, either in a hot or cold climate region. The Radiant Barrier performs at its best if combined with other roofing solutions that provide a batten cavity space and ventilation. 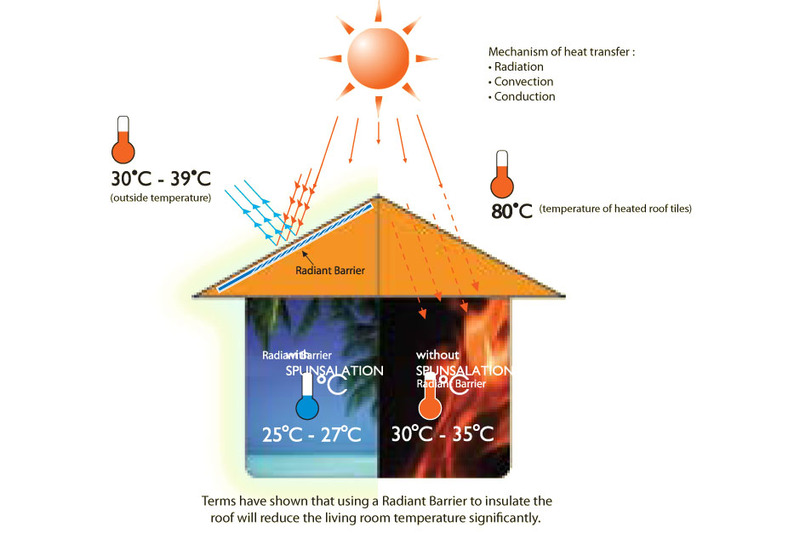 Terms have shown that using a Radiant Barrier to insulate the roof will reduce the living room temperature significantly.